Rustically inspired textured graphics are front and center with this new premium WordPress church theme from CMSTF. This is a Genesis framework WordPress theme featuring a user-friendly, hub-like homepage which links out to the various ministries and programs of your church. This intuitive layout makes your site as easily navigable as it is stunning to behold. As with each of our new church templates, this theme includes a sermon organizer, events calendar and more. Each of the images and photos you see in the live demo are also included with your theme purchase. 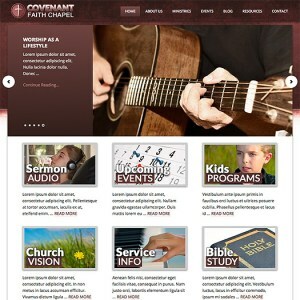 And, even better, this responsive WP church theme displays well on the spectrum of internet-ready devices people use, and your download includes the full install file from our live demo. That will allow your congregation to launch an impacting, effective WordPress church website in very short order. And with the user-friendly admin interface, ongoing site maintenance and management will be a smooth, simple process. And as always, if you have any questions, just email our helpful support staff for answers.